or Everything's Bigger in Texas. One of our first stops was Design Within Reach. 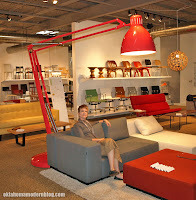 As you can see they have a Texas-sized version of the classic adjustable desk lamp. I enjoyed a mod pit group while basking under the glow of the giant lamp. I also visited my favorite chair, the Eames LCW. ..we soon found ourselves touring an area known simply as the "Disney Streets," because all the streets have names like Snow White or Peter Pan. This neighborhood was not only full of cool Fifties ranch houses, it's also the scene of some heated controversy over historic preservation. Wheee! We were almost surprised to learn that in Dallas, the apparent birthplace of the Mc Mansion, there's any interest in preserving a recent past neighborhood. But to our delight there is an appreciation for these areas, and a desire to maintain their architectural integrity and appeal as a community. 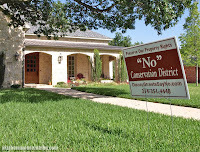 However, there appeared to be a vocal (well, there signs were plentiful anyway) movement working to put the kibosh on creating a "conservation district" in the Disney Streets area. After we left Midway Hills and the Disney Streets we stumbled across the Preston Royal Branch Library. It was pretty well preserved but the interior has been ruined with a drop ceiling and scary giant light fixtures. Not far up Royal Lane we hit the jackpot.. well, it was gold anyway. We were actually just making a quick U-turn when we spotted this beauty. St. Luke's Episcopal Church looked like an annex from ORU with all the gold aluminum adorning its round sanctuary. The church was built in 1959 and the architect was Bill Hidell, a protege of George Dahl. We stopped in and snapped a slew of pictures we'll be sharing with you in the near future! Afterward we drove by Bruce Goff's 1957 creation for Dallas businessman Eddie Parker, known locally as the Round House. The circular design is very reminiscent of the Frank House, not to mention the patented ceramic-over-glass window treatment! Oh, and it's on the market again if you're interested- asking price: $889,000. Our next sortie moderne was to the Kessler Woods development near the Oak Cliff area. We seem to keep discovering interesting places in this area southwest of downtown Dallas, just across the Trinity River. First it was the Belmont Hotel, then the Bishops Art District, and now this enclave of high-end contemporary homes being built by Sky Modern. Then, to finish off our trip, we decided to explore modern design of a lower price point. On the way home we stopped by Ikea. Sortie Moderne, love it! Kinda like Retro reconnaisance.